PARADIS, ROLAND, silversmith; b. c. 1696, son of Claude Paradis and Geneviève Cussy of the parish of Saint-Jacques-de-la-Boucherie, Paris; m. 3 Feb. 1728, in the church of Notre-Dame de Québec, Marie-Angélique Boivin; d. 28 April 1754 in Montreal. It is not known when Roland Paradis came to Canada, but at the time of his marriage in 1728 he evidently had been here for some years, since the kind of marriage licence that persons newly arrived had to present has not been found in his name. Paradis probably acquired his taste for the silversmith’s craft and did his apprenticeship in Paris with his father, a merchant silversmith. In 1728 he was in business in Quebec but did not stay there long, for on 25 June 1736, before the notary François-Michel Lepailleur in Montreal, he signed a “farming lease for three full years for a farm of two acres . . . back of Ville-Marie.” The same document also refers to Paradis as a “silversmith in Ville-Marie.” The earliest information about Roland Paradis’s silversmithing works comes from the account books for 1739 of the parish of Saint-Charles-de-Lachenaie, where it is mentioned that he received the sum of 145 livres 10 sols from the parish council in payment of “the material and workmanship for a ciborium for the Eucharist.” He also did various pieces of work for the churches of Sainte-Anne-de-Varennes in 1742 and Saint-François-de-Sales on Île Jésus in 1745. 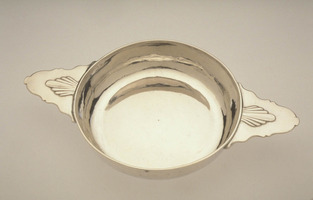 The seminary of Trois-Rivières possesses a silver chalice engraved with the inscription “1748 Paradis Fesite.” According to a contract signed before the notary Gilbert Boucault de Godefus, Paradis was still a merchant silversmith in Montreal in 1749. The Musée du Québec owns a few pieces of Paradis’s silverware: five silver soup spoons with plain handles and upturned bowls, a goblet ornamented with fillets, a pyx in the shape of a miniature ciborium with silver gilt on the inside, and finally a monstrance from the church of Saint-François-de-Sales on Île Jésus. Several other objects by Paradis are preserved in various parts of the province, particularly at the archbishopric, the Hôpital Général, and the Hôtel-Dieu of Montreal, and in the museum of the basilica of Sainte-Anne de Beaupré. All these objects are in silver and bear the stamp RP surmounted by a crown. AJQ, Registre d’état civil, Notre-Dame de Québec, 3 févr. 1728. ANQ, Greffe de Gilbert Boucault de Godefus, 10 sept. 1749; Greffe de Florent de La Cetière, 22 janv. 1728. ANQ-M, Greffe de F.-M. Lepailleur, 25 juin 1736; Registre d’état civil, Notre-Dame de Montréal, 29 avril 1754. Archives paroissiales de Saint-Charles (Lachenaie, Qué. ), Livres de comptes, I, 1725–1739. Archives paroissiales de Sainte-Anne (Varennes, Qué. ), Livres de comptes, I, 1725–1729. Archives paroissiales de Saint-François-de-Sales (Laval, Qué. ), Livres de comptes, I. IOA, Dossier Roland Paradis, orfèvre. Tanguay, Dictionnaire. Langdon, Canadian silversmiths. Morisset, Coup d’œil sur les arts. Traquair, Old silver of Quebec. Gérard Morisset, “L’orfèvre Roland Paradis,” Technique (Montréal), XXXIV (1959), 437–42. Michel Cauchon and André Juneau, “PARADIS, ROLAND,” in Dictionary of Canadian Biography, vol. 3, University of Toronto/Université Laval, 2003–, accessed April 26, 2019, http://www.biographi.ca/en/bio/paradis_roland_3E.html.